Apt. with wide luonge, great kitchen , 2 bed rooms, 1 bathroom, sleep 4 . Apartment totally renowed (june 20110 with wide lounge in which there is a sofabed kig size. The kitchen is very functional. The apartment has further 2 bedrooms. One with a queen size matrimonial bed and another with a single sofabed. 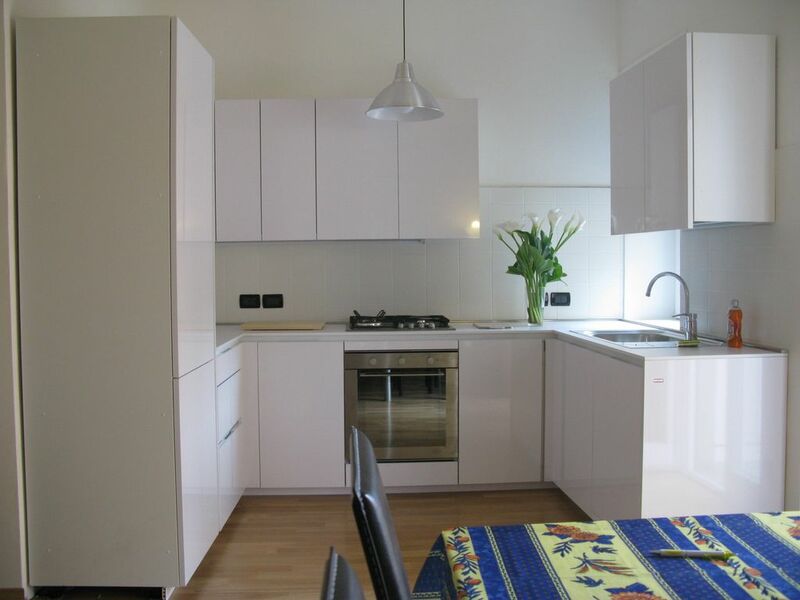 You'll enjoy this apartment because the location is wanderful, close to Arena opera tester and Piazza Erbe and the Romeo and juliet balconi.The breakfast is not preview but you,ll have coffee maker italian or american and just at the end of the stairs at 10 meters from the house you can have one of the best cappuccinos iin Verona. Very functional and completely furnished! Please book early otherwise it could be very difficult the management . Please book 20 days before your arrival almost. Cute design. Elevator. Great salon. Balcony. Air conditioning in every room. Large comfortable bathroom. Large fridge. Kitchen equipped with all necessary utensils. If you do not want to cook, a million cafes and restaurants of any level are 5-10 minutes from home. We are very satisfied. We booked this apartment due to its central location. It is half way between the station and the arena so perfect for walking around the city. We got the Bus from the airport and then had an easy 10-15 minute walk to the apartment from the station. Whilst there we got trains to both Venice and lake Garda so very accessible. The apartment was very clean and well equipped and even though near to everything it was nice and quiet. Our trip was booked around a visit to the opera at the arena but unfortunately this was the only disappointment of the trip! The organisation and acoustics were terrible. We loved Verona and we would definitely visit both this city and apartment again. I really appreciate your rating about my apartment and I would have all my guests so kind and graceful like you. Please return to Verona. Regarding the acoustics in the theater there are places with very good acoustics and you have tu ask to ticket box man where they are. You will receive a precise reply. Thanks agai for your rating and have all my best. Arrival at the apartment was simple as Fernando turned up at the appointed time and greeted us with a smile. Not knowing how close it was to Porta Nuova railway station (15 minutes walk) we took a taxi which cost us €12. Of course, if you have heavy suitcases then a taxi could be the answer but if we returned we would use Google maps on our mobiles and walk. The apartment is lovely, clean, well maintained and had all that we needed for our stay in Verona. We stayed for 5 nights. The restaurant Tre Risotti is literally next door to the entrance of the apartment block. It is a good one with freshly prepared food, does not charge tourist prices and the service is also very good. It is closed on Monday and Tuesday evenings but is highly recommended. We ate on Piazza Bra at Casa Mazzanti and do not recommend it as the food is not freshly prepared and the service we received and observed was poor and the food only almost average and at tourist prices. Among the others that we used was Via Roma 33 opposite Castelvecchio, which is worth a visit. The supermarket (Spar) was about 4 minutes walk, and was large catering for all your needs. Turn left out of apartment block door then turn immediate right. Look for a large white archway on the right. The Arena is about 5 minutes walk and a good landmark when navigating this part of the area. The museums are very good and reasonably priced, but be aware of opening times. We visited Teatro Romano, Castel San Pietra, Museo di Opera, Castel Vecchio, Lapidario Museum, Juliet's Balcony and of course the Arena. On our way, we frequently went through Piazza Bra, Piazza del'Erbe, Piazza dei Signori, among several others. Piazza dei Signori is beside Piazza del'Erbe and has the statue of Dante. To find our way around we used a map printed out from Google Maps. Hopefully, this comment will be useful and we recommend the apartment and a visit to Verona. Purtroppo ho fatto un errore di battitura dal mio iPhone e non ho dato per errore 5 stelle su tutto, specialmente sulla pulizia! Si tratta di un guest che tutti gli hosts vorrebbero avere! Veramente perfetti! Spero che tornino nel mio appartamento. Sono molto soddisfatto di queste persone! Really enjoyed property. Stayed there 18 days and was disappointed that the washing machine was broken . Had to go to Laundrymat and lug everything there and sit during our vacation. Asked for slight discount for extra cost and trouble but was not given one. At first they wanted to charge us 100 to fix it but then waived that. Was broken when we arrived and actually helped out owner when we tried to use it and water came pouring out on laminate floors. Dario was nice and Fernando went out of his way to show us a few things. He also took us to airport. I would stay there again. The location was perfect. My daughter and I stayed here in late September 2017. We couldn't have been happier. Dario and his colleague Fernando made the arrival process very smooth - very welcome since we were dog-tired from the trip! The apartment itself is nicely updated and decorated with all the modern conveniences. It was very spacious for two people but could easily handle more. There is a master bedroom, one small single bedroom, and the couch in the living room is a sofa-bed. The neighborhood is fantastic - about a 10 minute walk to either Piazza Bra or the train station, so a good base for exploring the city center or venturing off on day trips. There is a very well-stocked supermarket just up the street (Marconi, toward Piazza Bra) and several restaurants and coffee-bars within a 5 minute walk. Didn't frequent many of them since we were out-and-about, but Bella Napoli was a good casual place for decent pizza. Appartamento '#12' totalmente ristrutturato nuovo in giugno 2011. Molto centrale distante 5 minuti a piedi dall'Arena, il più grande teatro all'aperto del mondo. 10 minuti a piedi dalla stazione ferroviaria. Aria condizionata in tutto l'appartamento, 4 posti letto, 1 bagno, 1 camera matrimoniale + camera studio+ Grande salotto con cucina completa di lavastoviglie. Molto comodo nella città di Giulietta e Romeo immortalati dal grande Shakespeare! E molto vicino al centro città. Alla conferma che deve essere data circa 20 gg prima per potere eseguire le formalità verrà' comunicato il tipo di pagamento. Nessuna richiesta di cauzione. Ricorda dovrai pagare inoltre una tariffa di pulizie finali di Euro 65,00.